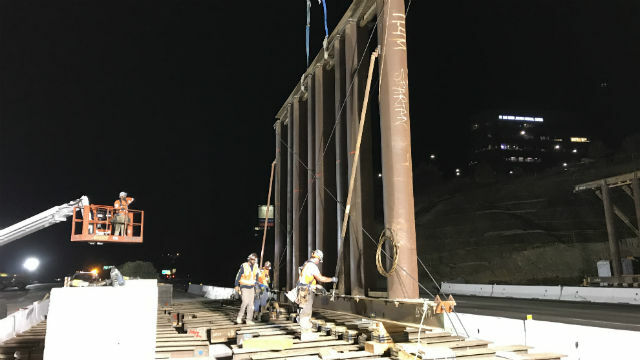 Motorists are being warned of delays on Interstate 5 through the La Jolla/University City area as crews work on overhead utility lines to make room for the future Mid-Coast Trolley extension. Crews are scheduled Oct. 29-30, from 11 p.m. to 5 a.m., and will be working on the southbound I-5 onramp from Gilman Drive and the westbound Highway 52 to the northbound I-5 connector, according to SANDAG. Motorists should expect periodic ramp and freeway lane closures on these routes. Southbound motorists will be detoured to Nobel Drive via northbound I-5, and back to southbound I-5. Northbound motorists will be detoured to Clairemont Drive via southbound I-5, and back to northbound I-5, according to SANDAG. Traffic controls and detour signs will be placed to alert motorists in advance. The trolley extension is under construction with completion expected in late 2021.